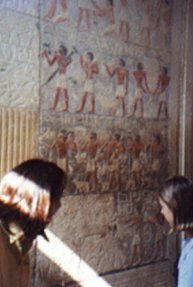 Whilst we were visiting various Egyptology sites recently we came across this picture that was taken inside the Tomb of Ptah-Hotep, at Saqqara, Egypt, which dates back to the 5th Dynasty. Ptah-hotep served during the reign of Izezi as a sage. His maxims are in the Prisse Papyrus which are in the Louvre. Izezi was the eighth king of the 5th Dynasty and ruled Egypt from 2388 till 2356 BC. 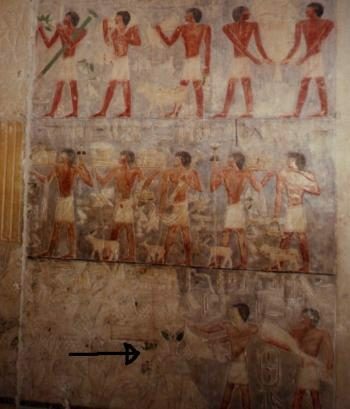 The picture shows servants offering food to the Egyptian sage and Philosopher Ptah-Hotep (who is sat at a table to the left of this part of the picture). We were flabbergasted to say the least when we took a closer look at this image and could make out an ‘alien grey’ in the bottom of the picture! Does this prove that the building and placement of the Pyramids were aided by alien intelligence? We have only been able to find the three images of this picture that you see here and have learned that this particular wall mural does not appear in any official guidebooks!… I wonder why? 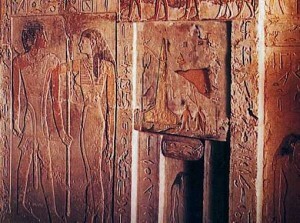 This same mural is in an old book called ‘In The Shadow Of The Pyramids – Egypt during the Old Kingdom’. could not even recreate a similar coffin out of rock today – even with our laser technology! It also ties in with the Egyptians infatuation with Orion. The three Pyramids at Giza have been proven to line up exactly with ‘the belt’ in the constellation of Orion (Discovered by Graham Hancock and Robert Bauval). We also have to remember that Betelgeuse, which is a star in the Orion constellation has been suggested in ancient history as the home planet of aliens that have visited Earth. You may have seen this picture before. 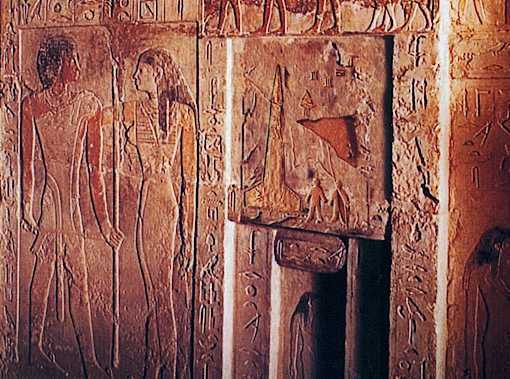 These images were found on the ceiling beams of the 3000 year old New Kingdom Temple — specifically dedicated to the chief god of the Egyptian pantheon, Osiris. located several hundred miles south of Cairo and the Giza Plateau, at Abydos. As you can see, images of a helicopter, submarine, plane and hovercraft are depicted! Again this piece of ancient art seems to suggest that the Egyptians knew about the latest technology that we are using today. 6 wooden gliders were found in one of the Pyramids at Saqqara. 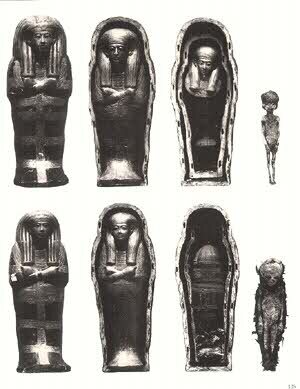 Although 5 of them have been destroyed, one does exist in the Late Dynastic Room at the Egyptian museum in Cairo amongst the wooden bird collection. Some readers believe that this could be a bird, but birds do not have tails that fan sideways. The release of the image on Mars in recent times that show the image of Nefertiti, the Egyptian Princess also strengthens the link between ancient Egypt and alien civilisations. 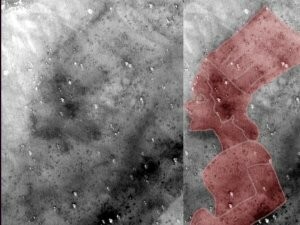 Lets not forget about the Cydonia region on Mars that include ‘The Face On Mars, The D & M Pyramids (that also are placed to line up with Orions belt) and other Mars anomalies that are related to Egyptology! It seems that Egypt is not the only place that has been visited by Aliens in ancient times. 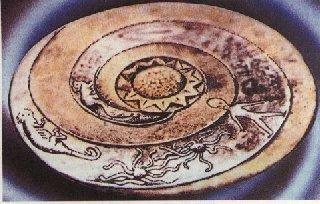 This plate called ‘The Lolladoff plate’ is a 12,000 year old stone dish found in Nepal. It clearly shows a disk shaped UFO (top of pic). There is also a figure on the disc looking remarkably similar to a Grey. This picture was discovered by us recently in a book called ‘Life and Death of a Pharaoh – Tutankhamen’ by Christiane Desroches-Noblecourt, published by World Books in 1963. It is allegedly of a seven or eight month old unborn child, but certainly looks very different to that in our opinion. For instance, look at the length of the fingers! they are extremely long, unlike those of an infant just about to be born, or an adult human for that matter. Also look at the shape of the head and the large eyes… are you getting the picture yet? The paragraph that accompanies the picture reads as follows: ‘Two small coffins, bearing Tutankhamen’s name and laid head to foot and side by side in a plain chest, contained the mummies of two seven or eight month foetuses, one of them probably female (pictured). It does not seem possible that in the midst of such a special collection of objects a place should have been set aside for two supposedly still-born children of Tutankhamun and Ankhesenamun. fully developed and yet the one pictured below is supposed to be 5 months premature? The premature baby is nearly 4 inches longer than the fully developed one? How can this be? The wall mural that is pictured to the left resides in a temple in the goldmines of Kush. Notice the rocket and figures standing by it! READ Can one create a new reality on a new timeline?